Recently I have been playing around with the recent change to Confluence of Fate. I always heard that Attachment Lance was a good deck and play style but it never really interested me before. 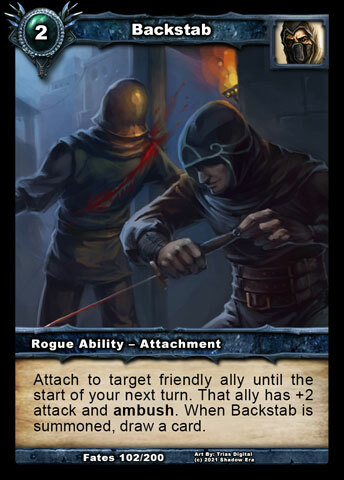 As I was looking through the attachments I see that lots of the Rogue attachments are cheap they also provide a cantrip, and there is also the very inexpensive and aggressive Strength of Conviction which greatly benefits the Templars so I was now infinitely curious. 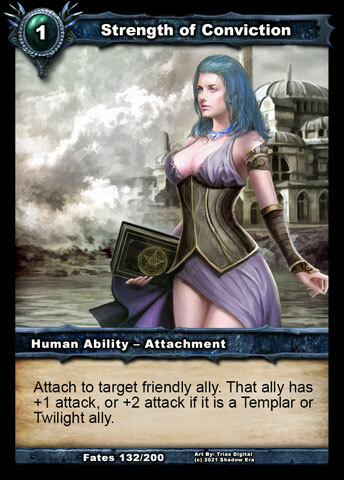 In Shadow Era, the Templars Alignment flavor is about blessing via attachments, arcane damage, and protect/cure abilities. There are some buff/debuff relationships (ex. increasing damage, decreasing damage) as well as having some synergies revolving around abilities/attachments. 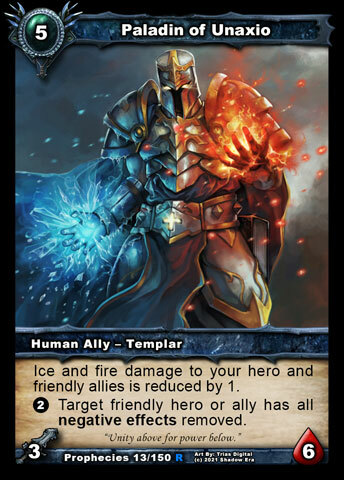 In Shattered Fates there are not a lot of Templar allies to really pick and choose from but the available ones work pretty favorable in this particular build. One of my favorite things about this deck are the early game synergies. Ideally you will want to play Avenger of the Fallen on Turn 2. The 4hp body is pretty strong play in relation to the synergies that can follow because you really want the staying power so that a body will be available for you attachments in following turns. 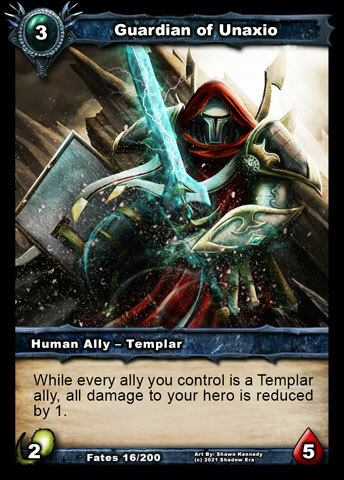 Later in the game when you have 3 Templar allies in the graveyard Avenger of the Fallen becomes a strong play as his attack to casting cost ratio is very strong and Lance has the ability to haste him in. Confluence of Fate is the whole reason I even attempted this build. 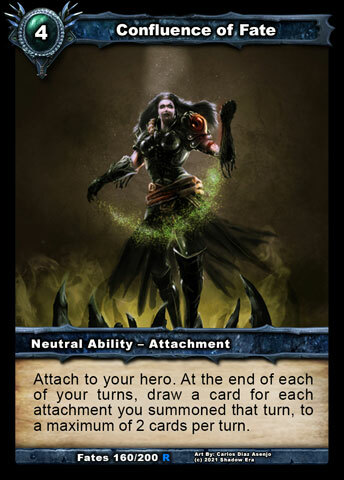 The recent Shadow Era Update removed the Sustain 1HP cost leaving the initial casting cost at 2 and allowing for drawing up to 2 cards per turn. Confluence of Fate also draws off itself so it has a synergistic relationship with this other attachments of this build. Ideally you would like to play Confluence of Fate as your turn 3 play with Strength of Conviction (on your turn 2 Avenger) allowing you to have strong board presence, your primary draw engine set up and you will draw 2 at the end of your turn. 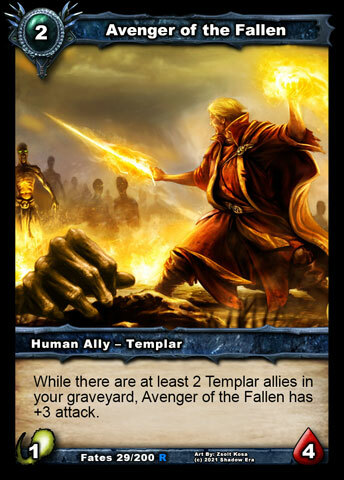 Confluence of Fate is your secondary Turn 2 play if Avenger of the Fallen is not available. Your alternative offensive turn 3 play is Strength of Conviction (on Avenger) then Mystic Zealot. While this will not allow you to have a draw engine setup yet it gives you a very strong opening as you will be able to deal 3 damage from 2 sources (6 total) on turn 3 which can kill anything available this early. It is also a great counter to rush builds allow you to crush the rush while manipulating the board in your favor. 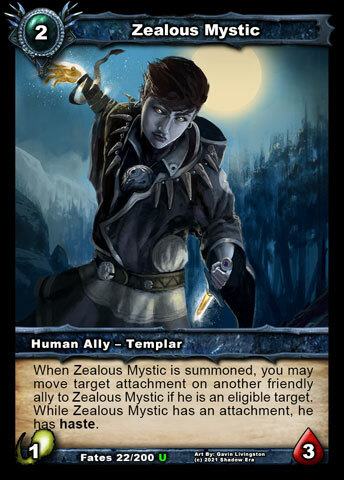 Later during the game Mystic Zealot can manipulate your opponents negative attachments (Crippling Blows, Consuming Fear, etc) allowing you to play with only 1 copy of A Legend Rises. Additionally Mystics cheap cost combined with cheap attachments can provides nice haste damage outlets to compliment Lance’s haste from his ability. Your defensive turn 3 play is Zailen Crusader followed by Silent Strike. This gives Zailen Crusader stealth and a cantrip draw. The stealth is really nice because it reduces your opponents options to remove Zailen which is very strong ally for this type of build. Backstab is also a good attachment to combo with Zailen Crusader with your possible turn 2 Avenger. Lastly Zailen reducing the cost of A Legend Rises is extremely valuable to not only free up a friendly ally but also by possibly allowing a complimentary ally to be summoned creating a very strong tempo swing. Knight of Unaxio is the hammer of the build. He is an extremely strong play when hasted with Lance’s ability. His strength comes for the fact that he has an extremely rapid growth pattern allowing him to grow +2/+2 by discarding an ability once per turn. 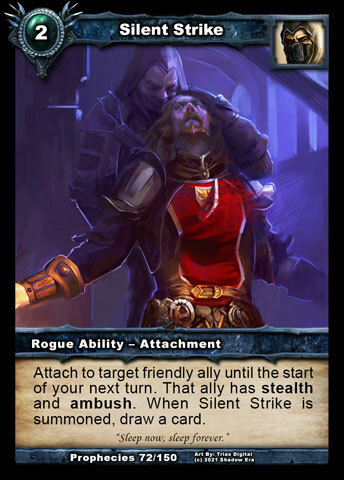 Couple in with the stealth from Lance’s ability (or late game Silent Strike) you are able to increase his survivability by reducing counters of physical combat. The fact that there are some immediate counters (even stealthed) means you do not always want to use Knight of Unaxio’s ability to grow, instead opting for the temporary attack boosters of playing the attachments Strength of Conviction/Backstab so that you can get the draw from Confluence of Fate. 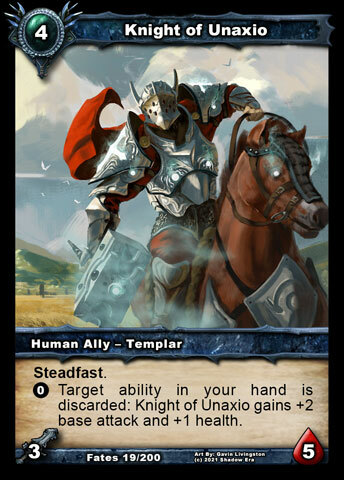 Extra copies of Confluence of Fate are generally the primary discard targets for Knight of Unaxio. Guardian of Unaxio and Paladin of Unaxio are your complimentary protection allies. Guardian of Unaxio is really great at reducing damage to your hero which makes him very strong against Rush builds. He has an affordable casting cost of 3 which allows him to be played early and high health meaning your opponent will probably need to use 2 sources of damage to take him out. Paladin of Unaxio does not see an extreme amount of play but he is also very useful tech. Like Guardian of Unaxio he reduces damage, however he is generally limited to tech against Mages, Fire build, Skervox (rare) and Embers Jericho (again rare use because you don’t want to feed him allies). All in all this is quite possibly one of the most synergistic decks I have ever built and is fairly easy to play. It is a great introductory deck I would recommend to new players helping to understand Lance, Templar Alignment, and Attachment based decks. I hope you enjoyed reading and playing this deck. 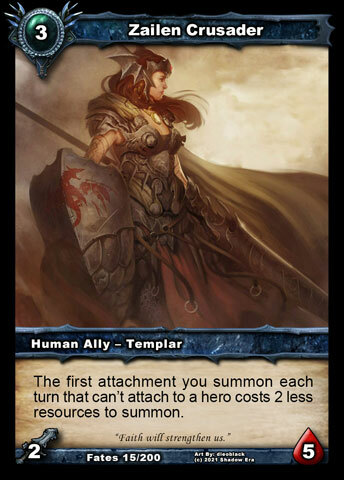 Tagged alignment, attachment, lance, Shadow era, shattered fates, templar.